While made for a woman’s practical role of ironing her family’s clothes, mangle boards were also deeply symbolic of love and marriage. In Norwegian tradition, a male suitor carved and placed a board on his love’s doorstep. If she shared his ardor, she brought the board inside and their courtship began. If she rejected his proposal, he would have to move on and carve a new board. This mangle board was created for Little Norway by pastor-turned-woodworker, Edward Barsness of Black Earth, Wisconsin. In semi-retirement, Barsness studied woodworking at Vesterheim’s heritage center in Iowa and also in Norway. The elegant acanthus carvings seen on this piece are just one of the Norwegian motifs Barsness utilized in his creations. 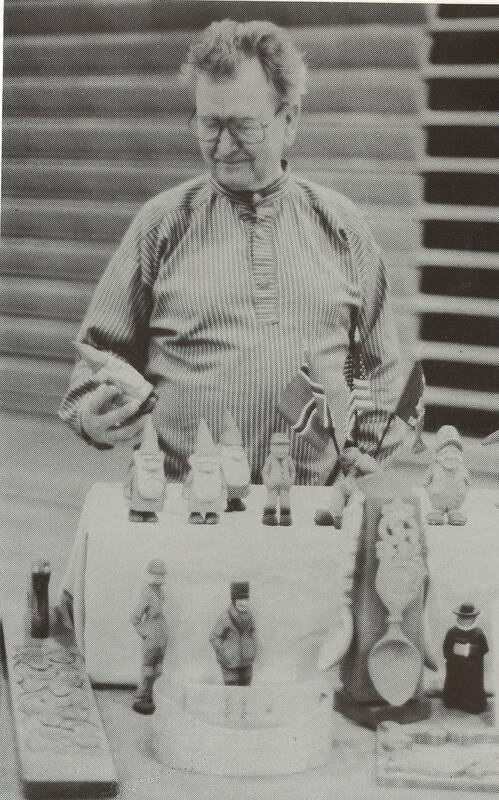 Ed Barsness poses with his carvings at Mount Horeb’s Fall Festival in 1990. MHAHS 5×7.00914.